Present days while customer needs require more and more attention to be satisfied and this requirements becomes stricter day by day, quality control is ultimate necessity at the each Single stage of travel service rendering. Thus, the quality of any service rendered by us, is an obligatory requirement of all the employees of Oriental Express CA Ltd.
Due to this and also in view of increasing the competitiveness and ensuring quick reaction on the market requirements the management team of the Company made a corporate decision at the end of 2008 to develop and introduce quality management system inside the Company as per requirements of International Standard ISO 9001: 2008. More than a year of preparation, interim audit, monitoring and analysis has been incarnated in result- the Company team has successfully achieved Auditor Certification on March 12, 2010. 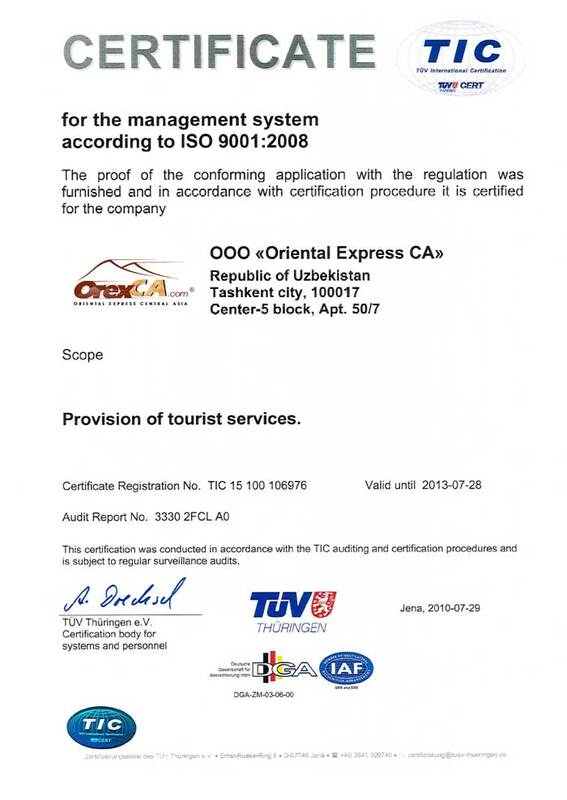 Now WE - Oriental Express CA Ltd. (trade marks OrexCA.com and ОTPUSK.UZ) - are the first and at the present time only one tourism Company in Uzbekistan and Central Asia that has succeeded in introduction of quality management system as per International Standard ISO 9001:2008. 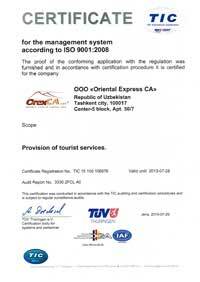 Conformity with the requirements of ISO 9001 confirmed by independent certification body Sert management Ltd. - the official representative of international certification agency TÜV Thüringen in Uzbekistan - proves that our company is capable to render its services in accordance with customer needs and basic requirements (those of legislation, internal requirements etc). The first significant step of Quality Control is definition of customer requirements or expectations. Marketing department of our Company provides continuous market research, specifying general tendency and market requirements of tourism services. We thoroughly collect and record expectations of every specific customer upon receiving of orders/applications on services of our Company. Next step of our Company has defined processes (kinds of activity) necessary for implementation of all customer requirements or expectations without exception and has limited responsibility of the personnel participating in these processes. The processes are being under control. To ensure quality Standards in our Company the manuals system in the form of procedures and processes description has been developed. That lets employees of different departments understand who has to do what and when it has to be done as well as who is a responsible person and what the responsibility is elaborated for. Ultimately all this allows to focus on those factors that affect the main activity of our Company - tourism services; to estimate risks, consequences and impact of the kinds of our activity on consumers, suppliers and other interested parties and to favour more efficient organization of the work process in a whole. Finally, all the above mentioned leads to achievement of the targets that the Company faces in most efficient way. Our main target is to maximize satisfaction of customer requirements and expectations and continuously reinforce the image of Oriental Express CA Ltd. as one of the most intensively developing on-line companies of Uzbekistan, Central Asia and Trans-Caucasian region as well as strengthen its leading positions on the tourism market of the region. That is the reason why sophistication of Quality Management System has been continuously advancing in our Company in accordance with the requirements of ISO 9001:2008.